A little bit more of a candid view into our daily life. I am humbled and thankful! I just finished reading your book, and wow, it is so thought provoking! Thank you so much for loving on people as Jesus did,and for inspiring others to do the same. I pray that God helps me to see and love others as He does. Katie, I am a new Christian, and one of my new friends from church shared the Red Carpet story on facebook, so it ended up on my wall. So this is the second time I have heard a friend from church mention your story. So I clicked on your picture and read more about you and your children and your self-sacrificing, and yes courageous life choice. I am deeply touched by your humility and candor as you describe how you feel as you get tugged out of bed in the early hours of the morning. I am a single parent, and some days it is hard to want to face the day, but then I hear about people like you who listen to Jesus when He tells them,"You are needed here." I need the reminder that we are never alone. God is always with us. Jesus died for us so we may have hope. And all of the trials of every day are just temporary. You are not alone Katie. You are loved. Lovely article, Katie. Very wise ending: "Be imitators of Christ alone." Amen and may God continue to strengthen and bless you. Not a goofy picture at all, I love to see your candid moments. Praying for you! You know how when we are adopted by God, we are supposed to start looking like Him? I think your girls are starting to look like you. They have the same light in their eyes and the same heart. Just thought you should know that. Hello, Katie! I do- and would love to tell you just how amazing you are to the world. God has used you in so many special ways. The way you are with children, your sweet smile, and also the way you have always seemed to stay true to yourself. It is the kind in you that really stands out, and the way God uses you.. it's truly a beautiful thing. At the moment, I am in the middle of reading your book. (Kisses From Katie) The book is so very touching to me in several ways.. The way you talk about God is truly amazing, the relationship a person can have with God is the best thing in life. I am so happy you are caring for all of these wonderful children. Thank you Katie for your posts and your testimony - it is really encouraging! I myself am considering an opportunity I have to go to South Africa for a month or so to help at a childcare center. If you ever think of it, please pray for me while I seek to know God's will. I dont know if you see or read these comments but your video was posted on facebook and my heart just melted. I know you must be very busy but its been on my heart for awhile now about going into missionary work. I just have such a huge heart for the poor, broken and needy people in this world. please if you can email me: larissa_goodanetz@yahoo.com I want to get involved. Im just not sure how to make that leap of faith quite yet. "For just as we share abundantly in the sufferings of Christ, so also our comfort abounds through Christ." Blessings from Oregon! Looking forward to seeing you. Hi Katie!I'm Olga! I admire you so much! I read your book just before I travelled to Uganda this summer. Just before my NGO The Mirembe Children's Project started for real. It has now bee nup andd running for 10 months and we are growing each day. I'm swedish and I'm traveling out Uganda once a year as for now. It would be really fun to get in touch with you to share experiences and thoughts. Its been a while and I hope everything is well. I don't know why but you came to mind today. If you need anything please don't be afraid to ask. You're awesome. cute pic...but from my seat...that heart is HOT! Can't believe your still single....but I imagine not for long...Ben didn't fully understand what he had! Finished your book this weekend and will be praying for you, your family, and your ministry! I am also sharing your book and story with others! I am writing a paper on your for my leadership and faith class on women of faith. I was wondering if you could email me some information on yourself, because there are requirements for my paper that I cannot find on the internet. (sorry if that is creepy). If you could please email me at 34502@sjabr.org that would be splinded. You truely are one of God's angels sent to earth and I feel blessed to have chosen such a wonderful person as my "woman of faith". My dear Katie, Well done! Indeed," On earth as it is in heaven..." Mother Teresa reminds us, "...to do little things with great love..." The root of courage is heart, ( cor/cordis Latin for heart) and our Lord Jesus, Truth Incarnate, Wisdom Incarnate, encourages us, " Do not let your hearts be troubled, have faith..."
I am a junior at King's High School in Shoreline, Washington. This June of 2014 I am going on a short term (about 3 week long) mission trip to Uganda and Rwanda and I am beyond excited. The teacher leading our team, Deri Kispert, told me that there might be a chance of making a little detour in our travels to meet you in person. That would mean so much to me, just reading your blog has forced me to recognize that God is SO present in places of desperation and inspired me to look at people through Christ's eyes and not through my own judgement. I understand that we probably would not get to meet any of the children in your program because of their situation but just to talk to you about how God is working in Uganda would be such a great experience. I am praying for Africa as a whole and especially your ministry in Uganda! God is doing such extraordinary things in your life! If you have not already, please consider meeting us in June, it would be a huge blessing for me personally and certainly the rest of our team! I am a junior at King's High School in Shoreline, Washington. I am planning on going on a short-term mission trip to Uganda (!) with my school this June of 2014. I am beyond excited to see this amazing country and its people. One of the leaders of our team, Deri Kispert, has mentioned to me that there is a chance of meeting up with you on our way through Uganda. I have started reading you blog and learning about what our AWESOME God has done in your life. I'm not sure if you have been at all involved in planning all of this but selfishly I would LOVE to meet you after reading about your journey in Uganda. It would be such a huge blessing, and I hope that we could bless you as well. I understand that we wouldn't get to meet any of the children in your program and I can totally see why, but to take you out for a meal and share stories would be amazing. I'm not really the person to contact for this, you might have already heard from our leaders, but I just wanted to ask you personally if you would give it some consideration. We know that you have a tight schedule! Thank you so much for sharing such compelling stories straight from His heart. Katie, I just finished reading your book and am amazed at your faith. I share your story often with my high school English students. What are ways we could help? We pray for you, your girls, and your ministry. Is there anything you need to help in further you love in Uganda? I just finish reading your book. Thanks for the inspiration. I just finished reading the book " Kisses from Katie". Its inspiring and its more than just someones handwriting. There are books that inspire you because of what people do and than there are books that inspire you because as you read you see the Hand of Jesus active in this world today. And thats what that book was for me. From the beginning to the end it was about doing your job in the center of Gods will. Thank you for publishing the book and letting other see the working hand of Jesus though His children! I just finished reading the book " Kisses from Katie" What an inspiration. There are books that inspire you because of what people do and than there are books that inspire you because of how Jesus works thought people. And thats what this book was for me. It was the working hand of Jesus active among His people. From the beginning to the end, it was all about being and staying in the center of Gods will. To do all the work in the center of His will. Thank you for publishing it! Hi Katie! I Ever since my first service trip I've been restless to do more. I've been yearning to become involved in long-term missions... so my mom actually recommended that I read your book! What a story you have. My mom also suggested that I contact you-- would you have need for any help in Africa? Is there any way I could fly over to assist in your work? I'm trying to find a way to Africa, but actually finding a place to stay is rather frustrating. My email: sm1414@messiah.edu. Thank you for everything that you do. Your testimony changed my life. God bless you more! 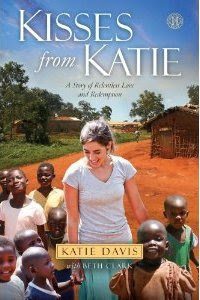 Katie, I read your book in June of 2012 while my husband was in Niger on a mission trip. God touched my heart and I too realized the fact that my God did not ask me to go, but He told me to go. In November of this year, my husband and I returned to Niger . We worked with the Zerma people, an Unreached people group. We were so blessed to be ble to tell His children that they do have a God that loves them. Some had never heard of Jesus, nor had they ever seen a white person. I came back and reread your book. What an impact it had for a second time. Thank you for allowing God to use you. Thank you for being obedient to His call. The orange dirt of Niger will never leave my sandals, and God's children will never leave my heart. I plan to return in 2014 to do as much as I can. ( which I feel is so little) . May God continue to bless you and your precious family. May He continue to enlarge your territory, and may He keep you safe and in His will. Do you need any kind of spiritual help, do you have problem in your relationship, marriage and is anyone owning you and refusing to pay back, did you just lost your job and want it back so desperately have you have you be scam by fake spell caster, is there anything you want so much but you can't have it because of someone else, you need not be frustrated or have sleepless night about it anymore because ezizaoguntemple@gmail.com or +2348058176289 is here to solve all your problems by casting spell on them.